Working as a freelance blogger means that my work wear wardrobe goes from one extreme to the other. Since I do spend a lot of time at home, I have a fine selection of PJs that I wear probably more than I should but then my job also calls for some more glamorous outfits for evening events and smarter workwear for business meetings. Since its the start of the year, I’m on the look out for some new workwear and I’ve found some great ladies suits and tailoring pieces that are stylish yet practical. The Linea Sarah Soft Tailored Dress is a fantastic option for those who are looking for a feminine and sophisticated workwear option. The great thing about wearing a dress like this to work is that you can add tights and a cardigan to keep you warm should the weather require it and you can take your look from day to night by adding a statement necklace and a clutch bag should you be heading out for drinks after work. A boucle jacket looks great with this kind of garment too and will give your outfit a Chanel air. Also from the Linea Sarah line, the Soft Tailored Trousers will give you a smart look for business meetings but they’ll keep you looking stylish too with their exposed gold zips. These are what attracts me the most to these trousers as I love an exposed zip! I really love workwear lines that give you alternative options such as those offered by Austin Reed. 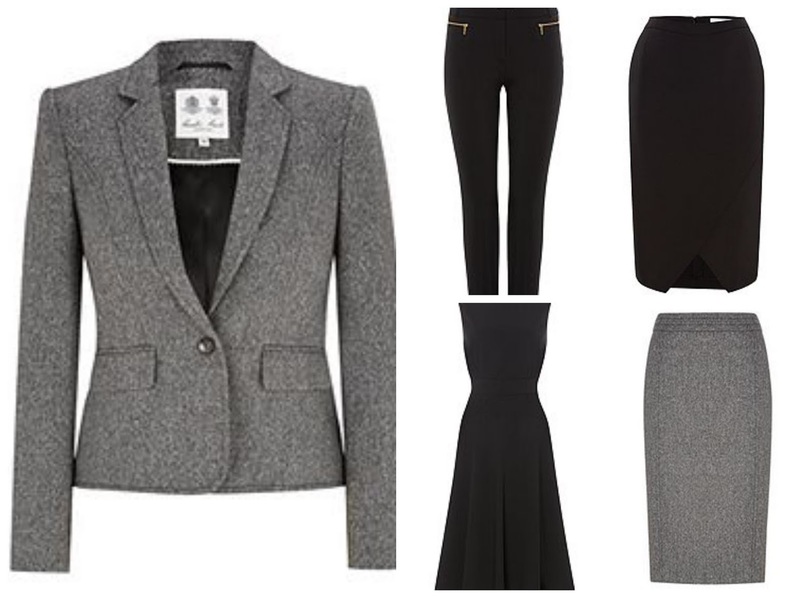 They have a gorgeous black and white tweed jacket with power shoulders that screams #GirlBoss and a fastening at the waist that keeps the suit jacket looking feminine. This jacket can be paired with either the Austin Reed Black and White Tweed Skirt or with any of their pairs of trousers which is great as it enables you to change up your look for the warmer months or purely based on preference as to what you’d like to wear that day. Another skirt that I love the look of is the Linea Sarah Soft Tailored Skirt. This piece is a great twist on the traditional pencil skirt as it has a short split and wrap over detail at the front. I really like the way this piece has been designed as I would imagine that it would have more give in it than a traditional pencil skirt and would therefore be more comfortable when sitting down. When at work all day, its important to me that I feel confident that I look good in what I’m wearing but its even more important that I feel comfortable. After all, if you’re wearing something for a long time and need to be on the ball, you don’t want to be distracted by feeling awkward in your outfit! What are your favourite pieces of workwear? I'm self employed so I mainly work from home. My favourite pieces of workwear are my pjs 😀 I do work a few hours in a local shop, and it's freezing cold in there, so I have a super hooded vest I wear to help keep me warm. I wish it was warm enough to wear these lovely items you've posted about though – so pretty! Even though I work in an office I don't actually wear anything smart like this I feel like I should rally up my game though and dress a bit smarter! I love that blazer! It's something what you don't just have to wear smart either, you can wear it with a nice pair of jeans too! Business work wear is one of my favourite outfit types to wear! I always feel so classy and smart, and it can easily be sooo stylish. Wonderful outfit choice! I love the tweed blazer it is gorgeous and so much better than the standard black and white uniform- as much as I love monochrome it is good to mix things up a bit! I work both from an office and from home – work wear in my industry is more casual but I see a few suggestions on your list that would be great for wearing on days when I am meeting clients or pitching for new business. Workwear is one of my favourite things to shop for as its always so smart! Love the dress! Love the tweed blazer. So stylish. I would wear this. I really like that grey jacket! Now I wish that I needed to have more client meetings so I could justify it. I don't have a job so I'd never thought about workwear except what my husband wears to his indsustrial job (ie. safety shoes and such). That first dress seems cool though. So many beautiful items, love the tweed jacket. I totally agree about the whole outfit choices being a blogger and always staying at home haha pjs it is! But that black and tweed jacket is really nice and would love to own one!